R. D. Burman – Pancham – he was GOD!! This blog used to have a different link, before I converted it to http://sanjaymehta.me. The earlier URL still works in fact, and it was and is: https://rdfan.wordpress.com. To make it more clear, let me write it again, for your benefit at http://RDfan.wordpress.com. Yes, indeed.. RD-fan..a die-hard fan of R D Burman. That is who I am, and as you can see, I wear my fan-dom on my sleeve. So when today, at the TiE Summit, when the surprise entertainment program of the evening turned out to be an R D Burman special, I was absolutely thrilled. But to my very pleasant surprise, the thrill was shared by at least half of the 1000 plus audience that seemed to be present there. 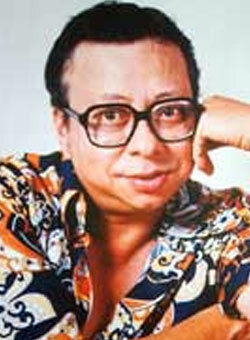 So there is obviously a magic about the man, Pancham-da! Even before the program started, the images of Pancham on the big screens created that anticipation and hope that it may be an R D Burman special. And then the program started with an Audio-Visual. Which in fact, showed some of the musicians who were in RD’s troupe, talking about him. As it turned out later, when the lights came on, we saw those same musicians on stage. The ones who had worked hand-in-hand with Panchamda, were to perform for us, right there. That itself was enough to give me goosebumps! RD’s songs bring back so many memories. The popular numbers that were sung reminded me of Kishore Kumar, Asha Bhosale among singers, Zeenat Aman, Helen, Rajesh Khanna, Randhir Kapoor, Jaya Badhuri and others, amongst the stars on screen. It was truly a time for nostalgia. Pradeep Udhas, a TiE charter member and a corporate head honcho showed that he had many aces up his sleeves. He sang many a number, in a style akin to Kishore Kumar’s. There were another two singers, one male and one female. The lady especially picked some of the hottest RD numbers, which not only got people to sing along and tap their feet, but had many of the audience to start dancing, either on their seats or going down towards the open area near the stage. The numbers that created such magic included Piya Tu Ab To Aaja, Dum Maro Dum, I Love You, Ek Mai Aur Ek Tu, among others. So what is it about these numbers that people of all ages found fascinating. There were many a young MBAs, who would be no more than 22-23 years of age, and then there were industry veterans, perhaps in their 50s and upwards as well. There were men and there were women, some from outside India as well. I do not believe that even a single person in the hall could stop from tapping his / her feet, and enjoying the great music. The ‘rock star’ of the evening was an 80-year old!! 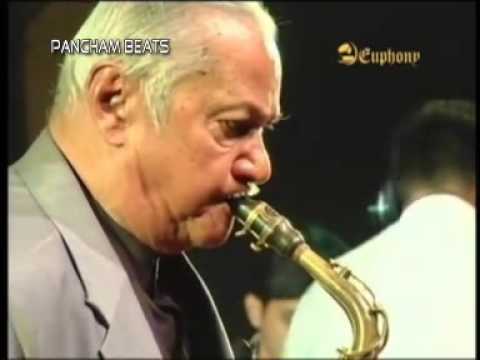 Manohari Singh was part of the original troupe of R D Burman. He is all of 80 years of age, but has lungs that would do a 20-year old proud! He plays a mean sax, and he showed his skills aplenty. There were two exclusives that he led, without support of vocals. Both were huge hits with the crowd. Specifically, his ‘Gulabi Aankhen Jo Teri Dekhi’ was the biggest hit of the evening, and the audience insisted on getting it more than once. He alongwith his accompanist on the trumpet, had no choice but to bow to the wishes of the audience, and we were able to enjoy that number from him, one more time. With due respect to all of the various music composers who were contemporaries of Panchamda, or who came after him, it is clear that he stands tall amongst them all. The most number of popular numbers, slow and fast, melodius and zippy, all belong to that one school, that of Rahul Dev Burman. Check out any “purani jeans” type of program on FM radio, and you will see that the most played and repeated songs come from the R D Burman archives, and that is proof that he lives amongst us, and will live forever. Oh, God took him away from us, little too early…his swan song, the masterful 1942 – A Love Story showed that he had much more left to give to us still. Just like you, I also did those naming ceremony with my email ID around 8 years back. SDKRDK–Sachin Dev, Rahul Dev, and Kishore Kumar. I sorely miss not attending this evening just because I did not like the voice of the singer. I could not bear because I used to sing those songs in my college and I felt the songs being on low notes. The next day, I was told that I missed one of the coveted opportunities to watch original RD-team members playings. Really, I call it one of the biggest misses of my life. RD was a GOD and he remains so! Cricket and Politics, T20 and Telangana: A Knee-Jerk Story? ?